Minnesota, one of the northwestern states of the American Union, the 19th admitted, and the 2sth in rank according to population, situated between hit. 43 30' and 49° 24' N., and Ion. 89° 39' and 97 5' W.; extreme length N. and S., 380 in. ; breadth from 183 m. in the middle to 262 m. on the S. line and 337 m. near the N. line; area, 83,531 sq. m. It is bounded N. by British America, the dividing line being formed W of the lake of the Woods by the 49th parallel, and E. of that lake by Rainy Lake river, Rainy and other lakes, and Pigeon river; E. by f.ake Superior and Wisconsin, from which it is separated by a line drawn due S. from the first rapids in the St. Louis river to the St. Croix river, and by the St. Croix and Mississippi rivers; S. by Iowa; and W. by Dakota, from which it is divided by the Red river of the North, the Bois des Sioux river, Lake Traverse and Big Stone lake, and a line drawn directly S. from the outlet of the last named lake to the Iowa boundary. The state is divided into 75 counties, viz. : Aitken, Anoka, Becker, Beltrami, Benton, Big Stone, Blue Earth, Brown, Carlton, Carver, Cass, Chippewa, Chisago, Clay, Cooke, Cottonwood, Crow Wing, Dakota, Dodge, Douglas, Faribault, Fillmore, Freeborn, Goodhue, Grant, Hennepin, Houston, Isanti, Itasca, Jackson, Kanabec, Kandiyohi, Lac qui Parle, Lake, Le Sueur, Lincoln, Lyon, McLeod, Martin, Meeker, Mille Lacs, Morrison, Mower, Murray, Nicollet, Nobles, Olmsted, Otter Tail, Pembina, Pine, Polk, Pope, Ramsey, Redwood, Renville, Rice, Rock, St. Louis, Scott, Sherburne, Sibley, Stearns, Steele, Stevens, Swift, Todd, Traverse, Wabashaw, Wadena, Waseca, Washington, Watonwan, Wilkin, Winona, Wright, Yellow Medicine. St. Paul, the capital, near the E. border of the state, 400 m.
N. AY. of Chicago, had 20,030 inhabitants in 1870. The other cities, according to the census of 1870, were: Duluth, 3,131 inhabitants; Hastings, 3,458; Mankato, 3,482; Minneapolis, 13,066'; Owatonna, 2,070; Red Wing, 4,260; Rochester, 3,953; St. Anthony, 5,013; St. Cloud, 2,161; and Winona, 7,192. Since the census St. Anthony has been annexed to Minneapolis. - The population of Minnesota was 6,077 in 1850, 172,023 in 1860, 250,099 (state census) in 1865, and 439,706 in 1870, including 438,257 wmite, 759 colored, and 690 Indians. The calculated population on June 1, 1873, was 552,459. Of the total population in 1870, 235,299 were males and 204,407 females, and 279,009 were of native and 160,697 of foreign birth. Of the natives, 125,491 were born in the state, 10,979 in Illinois, 9,939 in Maine, 39,507 in New York, 12,651 in Ohio, 11,966 in Pennsylvania, and 24,048 in Wisconsin. The foreign population comprised 16,698 born in British America, 1,910 in Denmark, 1,743 in France, 41,364 in Germany, 5,670 in England, 21,748 in Ireland, 2,194 in Scotland, 1,855 in Holland, 85,940 in Norway, 20,987 in Sweden, and 2,162 in Switzerland. The density of population was 5*26 to a square mile. There were 82,471 families with an average of 5.33 persons to each, and 81,140 dwellings with an average of 5.42 persons to each. The increase of population from 1860 to 1870 was 155.61 per cent., being a greater percentage of increase than that of any other state except Kansas. The number of male citizens 21 years old and upward was 75,274; of persons from 5 to 18 years of age, 142,665; attending school, 96,793. There were 12,747 persons 10 years of age and upward unable to read, and 24,413 unable to write; of the latter, 5,558 were of native and 18,855 of foreign birth; illiterates, 7.99 per cent, of the population 10 years old and over; number of illiterates 21 years of age and upward, 18,484, of whom 8,195 were males and 10,289 females. The number of paupers supported during the year ending June 1,1870, was 684, at a cost of $66,167. Of the total number (392) receiving support June 1, 1870, 126 were natives and 266 foreigners. The number of persons convicted of crime during the year was 214; in prison at the end of the 'year, 129, including 73 natives and 56 foreigners. The state contained 103 blind, 166 deaf and dumb, 302 insane, and 134 idiotic. Of the total population 10 years old and over (305,568), there were engaged in all occupations 132,657; in agriculture, 75,157, including 20,277 laborers and 54,623 farmers and planters; in professional and personal services, 28,330, of whom 620 were clergymen, 8,556 domestic servants, 13,037 laborers not specified, 449 lawyers, 402 physicians and surgeons, and 1,754 teachers not specified; in trade and transportation, 10,582; and in manufactures and mechanical and mining industries, 18,588. The total number of deaths from all causes was 3,526, being 0.802 per cent, of the population. There were 459 deaths from consumption, being 7'7 deaths from all causes to 1 from that disease; 177 from pneumonia, 19.9 from all causes to 1 from that disease; 112 from diarrhoea, 108 from cholera infantum, and 103 from whooping cough. The number of deaths reported by the state authorities in 1872 was 5,228, or 1.035 per cent, of the population. Of the whole number of deaths, 36.07 per cent, were from zymotic diseases, 13.50 constitutional, 18.61 local, 10.04 developmental, 4.72 violent deaths, and 17.04 unknown. The excess of births over deaths was 9,734. At the beginning of 1875 there were 5,973 Indians reported in Minnesota, who were settled on reservations in the central and northern parts of the state. They consisted of seven bands of Chippewas, with three agencies at White Earth, Leech lake, and Eed lake. These Indians have schools and are for the most part occupied in agriculture. - Lying nearly at the centre of the continent and occupying the most elevated plateau between the gulf of Mexico and Hudson bay, Minnesota forms the watershed of the three great river systems of North America: that of the Mississippi, which flows S. to the gulf of Mexico; that of the St. Lawrence, which, connected with the chain of northern lakes, has an easterly direction to the Atlantic ocean; and that of the Red river of the North, flowing N. to Winnepeg lake, which has its outlet in Hudson bay. A group of low sandhills in the N. E. part of the state, formed by huge deposits of drift overlying a local outcrop of the primary and metamorphic rocks, and called Hauteurs des Terres, forms the-dividing ridge between the Mississippi and Lake Superior. The Heights of Land rise by scarcely perceptible slopes from the general level, in no instance higher than 1,680 ft, above the sea, which is not more than 600 ft. above the average elevation of the country. These hills are commonly flat at the top, varying in height from 85 to 100 ft. above the surrounding waters. The principal group of these drift hills is subdivided into several ramifications. A prominent spur extends southerly from the Itasca crest of the Mississippi for perhaps 150 m., known as the Leaf mountains and the Ooteau du Grand Bois of Nicollet, and forms a low dividing ridge between the waters of the Mississippi and Red rivers. The crest of the dividing ridge between Lake Superior and the Mississippi is not more than 1,400 ft. high; and the highest of the trap summits north of the lake is but 1,475 ft. Generally the surface of Minnesota is an undulating plain, with an average elevation of nearly 1,000 ft. above the sea, and presents a succession of small rolling prairies or table lands, studded with lakes and groves, and alternating with belts of timber. Two thirds of the surface slopes S. E. with the Avaters of the Mississippi, the northern part of the state being nearly equally divided between the alluvial levels of the Red river valley on the northwest and the broken highlands of the northeast, which are mainly drained by the precipitous streams which flow into Lake Superior and the Rainy lake chain. - The Mississippi river rises in Lake Itasca in the extreme western elbow of the Heights of Land, and flows S. E., 797 m. of its course belonging to Minnesota, of which 134 forms the E. boundary; it is navigable about 540 m. within the state. The Minnesota traverses the lower part of the state in a S. E. and N. E. direction, and after a course through the state of 450 m. falls into the Mississippi at Fort Snelling, 5 m. above St. Paul; it is navigable about 300 m. The Red river of the North rises in Elbow lake, flows through several lakes, running in a S. W. direction, and then turning N. forms the W. boundary for 379 m.; it is navigable about 250 m. The St. Croix rises in Wisconsin, forms 129 in. of the E. boundary, and falls into the Mississippi; it is navigable for 53 m. In the N. E. part is the St. Louis river, which falls into Lake Superior, and is important as the first link in the chain of lakes and rivers of the St. Lawrence system; and in the S. W. are the head waters of the Des Moines, about 135 m. long, of which about '20 are navigable. All the rivers have numerous brandies, which are not navigable. The navigable waters within the state have a total shore line of 2,746 m., and a water line of 1,532 m. Along the banks of the Mississippi and of some other rivers are high bluffs, forming one of the most interesting and characteristic features of the scenery. Minnesota is distinguished for the number and beauty of its lakes. They have been estimated as high as 10,000 in number, and are from 1 m. to 30 m. in diameter; and many of them have an area of from 100 to 400 sq. m. Their waters, generally sweet and clear, abound in fish. The largest are the lake of the Woods, Rainy, Namekin, Bois Blanc, Vermilion, Swan, Sandy, Winibigoshish, and Leech lakes, and Mille lacs in the north and northeast, Red lake in the northwest, Big Stone, Benton, Sauk, and Swan in the west and southwest. - Notwithstanding the great area covered by this state, its rock formations, so far as they have been explored, appear to be limited almost exclusively to the azoic and lower protozoic groups; and over the greater part of the state these are concealed beneath the diluvial deposits which make the superficial covering of the rolling prairies. The N. W. coast of Lake Superior is made up of metamorphic slates and sandstones, intermingled with grits of volcanic origin and other bedded traps and porphyries. These are intersected by frequent dikes of greenstone and basalt; and among them are occasional deposits of red clay, marl, and drift. Behind this group are traced westward, along the northern boundary of the state, formations of hornblende and argillaceous slates, succeeded by granitic and other metamorphic rocks. These groups extend S. W. into the central portions of the state. Along the southern boundary the Devonian formation is found in the extreme west; the Niagara limestone succeeds this toward the east, and next occurs the Galena limestone, and then the Trenton limestone and the upper or St. Peter's sandstone, which overlies the Potsdam sandstone. These sandstones crop out up the valley of the Mississippi, nearly as far as Fort Snelling, where the lower Silurian limestones, which on both sides of the river lie behind and over the sandstones, meet in the valley and form the bluffs of the rivers. They are traced up the Minnesota river, curving round and almost reaching the southern boundary of the state again, and cutting off the continuation of the higher groups further northward. Thus throughout the state there appears to be no room for the carboniferous group. The lead-bearing rocks traced from the Iowa line are limited and of little importance. It is believed that the N.E. corner of the state will prove a valuable mineral field. Copper abounds in the mineral belt stretching along the N. shore of Lake Superior, and masses of the pure metal have been taken from Knife and Stuart rivers. Iron ore of good quality is found in considerable quantities around Portage and Pigeon rivers. Large deposits of peat exist in all parts of the state. In the Tied river valley are extensive salt springs. Slate, limestone, sand for glass, and clay are also found. The existence of gold and silver on the shores of Vermilion lake has been shown. A geological and natural history survey of Minnesota is now (1875) in progress,, under the direction of N. H. Winchell, state geologist, and S. F. Peckham, state chemist, professors in the state university, to whicb institution the survey has been intrusted by law. Up to 1875 a preliminary report and two reports of progress had been printed in the annual reports of the board of regents for 1873-'5. - The soil is fertile, two thirds of the surface being well adapted to the cultivation of all the cereals and roots of the temperate zone. It is composed generally of a dark, calcareous loam, abounding in organic and saline ingredients, and is retentive of moisture. The climate of Minnesota is pleasant. The winters are cold, but clear and dry, and the fall of snow is light; the summers are warm, with breezy nights, during which occur most of the rains; and the general purity of the air and salubrity of its climate recommend it for the residence of invalids. The country, especially above lat. 40°, is well timbered; pine forests extend far to the north, and birch, maple, aspen, ash, and elm abound. A large forest of hard-wood varieties, known as the Big Woods, and called Bois Franc by the early French settlers, extends over the central portion of the state W. of the Mississippi, and covers an area of about 4,000 sq. m. On the river bottoms are found basswood, elm, aspen, butternut, ash, birch, maple, linden, balsam fir, and some oaks; and in the swamps tamarack, cedar, and cypress. Among the wild animals are the elk, deer, antelope, bear, wolverene, otter, musk rat, mink, marten, raccoon, and wolf. Of birds, there are the golden and bald eagles, grouse, partridge, hawk, buzzard, owl, quail, plover, lark, and many smaller kinds. There are also the pelican, tern, sheldrake, teal, loon, wild geese, wild ducks, and other water fowl. The waters contain pike, pickerel, bass, whitefish, muskelonge, catfish, trout, and other varieties of fish. - Many natural objects of interest are found in the state. The Mississippi, studded with islands and bor-dere'd by high bluffs, presents a succession of picturesque scenes. Mountain island, with an elevation of 428 ft., Maiden's rock, celebrated in Indian tradition, on an expansion of the river called Lake Pepin, about 400 ft. high, and La Grange mountain on the same lake, are all notable. St. Anthony's falls, celebrated as much for their surrounding scenery as for the descent of the waters, which have a perpendicular fall of only 18 ft., are further up the river. A few miles beyond, between Minneapolis and Fort Snelling, are the Minnehaha falls, a romantic and beautiful cascade with a perpendicular pitch of 45 ft., flowing over a projecting rock which permits a passage underneath. Brown's falls, which have a perpendicular descent of 50 ft., and including the rapids of 100 ft., are W. of the Mississippi, on a narrow stream which is the outlet of several small lakes. There are also falls or rapids on the St. Croix, about half a mile below which is a noted pass through which the river has forced its way, called the Dalles of St. Croix, and others of less note on various streams. About 2 m. from St. Paul is Fountain cave, an excavation in the white sandstone, with an entrance about 15 ft. in diameter opening into a chamber 150 ft. long and 20 ft. wide. The cave has been explored for 1,000 ft.,without the termination being reached. - Minnesota has made the most rapid progress in agriculture during the past few years. The most prominent staple is wheat, for the production of which the soil and climate are most favorable. Of the reported cultivated acreage in 1872, wheat occupied 61*14 per cent., the average yield per acre being 17.4 bushels; in 1873 the percentage of acreage had increased to 63.53. Next to wheat the most important crops are oats and corn, the percentage of acreage in 1872 being 17.97 of the former and 10.44 of the latter. The soil and climate are also highly favorable to wool growing. In 18(50 Minnesota had 2,711,968 acres of land in farms, of which only 556,250 acres were improved, there being 18,-181 farms with an average of 149 acres each. In 1870 there were 46,500 farms of an average of 139 acres each, the total acreage of farm lands being 2,322,102 improved and 4,161,726 unimproved, including 1,336,299 of woodland, the percentage of improved land to total in farms being 64.2. Of the total number of farms in 1870, 4,030 contained from 3 to 10 acres, 7,948 from 10 to 20, 18,099 from 20 to 50, 11,078 from 50 to 100, 5,039 from 100 to 500, 128 from 500 to 1,000, and 2 over 1,000. The cash value of farms was $97,847,422; of farming implements and machinery, $6,721,-120; total amount of wages paid during the year, including the value of board, $4,459,-201; total (estimated) value of all farm productions, including betterments and additions to stock, $33,446,400; orchard products, $15,-818; produce of market gardens, $115,234; forest products, $311,528; home manufactures, $174,046; animals slaughtered or sold for slaughter, $3,076,650; all live stock, $20.118,-841. The productions were 18,789,188 bushels of spring and 76.885 of winter wheat, 78,088 of rye, 4,743,117 of Indian corn, 10,678,261 of oats, 1,032,024 of barley, 52,438 of buckwheat, 46,601 of peas and beans, 1,943,063 of Irish and 1,594 of sweet potatoes, 3,045 of grass and 18,635 of flax seed, 695,053 tons of hav, 8,247 lbs. of tobacco, 401,185 of wool, 9,522",010 of butter, 233,977 of cheese, 222,065 of hops, 122,571 of flax, 210,467 of maple sugar, 92,-606 of honey, 1,750 gallons of wine, 208,130 of milk sold, 38,735 of sorghum and 12,722 of maple molasses. In 1873 the number of acres under cultivation had increased to 2,332,672, of which 2,166,598 were sown with grain; number of farms, 58,373; there were 141,871 horses, 419,084 cattle, 4,005 mules and asses, 149,206 sheep, and 149,896 hogs. - As yet Minnesota does not hold a high rank as a manufacturing state, the people being more extensively engaged in agriculture. It has, however, a most important element for great industrial prosperity in the abundant water power afforded by its numerous streams. It has been estimated that about 100,000 horse power could be utilized during the day time throughout nearly the entire year, at the falls of St. Anthony; while the St. Croix frills are only second to them in hydraulic power. The total number of manufacturing establishments reported by the census of 1870 was 2,270, having 246 steam engines of 7,085 horse power and 134 water wheels of 13.054 horse power, and employing 11,200 hands, of whom 10,892 were males above 16, 259 females above 15, and 139 youth. The vast pine forests of Minnesota constitute an important source of wealth. It is estimated that about one third of the state is timbered land. On the head waters of the various tributaries of the extreme upper Mississippi and St. Croix rivers is an extensive "pine region," comprising an estimated area of 21,000 square mile-. Vast pine forests are also found on the shore of Luke Superior, and on the Red river and its tributaries. The cutting and sawing of logs affords extensive employment for men and capital. In 1873, 104,743.150 ft. of logs were reported to have been scaled in the North Mississippi district, including 101,880,670 ft. at Minneapolis, while 33,000,000 ft. were estimated to have been sawcl but not sealed. The total number of feet scaled in the St. Croix district was 17.01s, 1 8.338,970; sawed and scaled, 94,229. In the Duluth district the number of feet scaled amounted to 6,147,988. In the St. Croix district the manufactured lumber was reported at 74,003 -976 ft., besides 19,200,000 shingles and 19,477,-850 lath. - Minnesota has unusual commercial advantaps, having within its limits three great navigable water systems, which are connected with the railroad system of the state, and afford continuous channels of communication will. Hudson bay, the Atlantic ocean, and the gulf of Mexico. I he Mississippi is navigable to St. Paul about 225, days in the year. The completion of the Northern Pacific railroad, which has its E. terminus at Duluth, on Lake Superior, and is now (1875) in operation to Bismarck in Dakota, 450 m., will give the state direct communication with the Pacific. This road, which joins the lake and the Eed river water systems, is to be connected with the other railroads of Minnesota and the Mississippi river by three lines of railroad at the eastern, central, and western portions of the state. The Lake Superior and Mississippi railroad joins St. Paul, at the head of navigation on the Mississippi river, and Duluth, at the head of Lake Superior; while the former city will have direct connection with the Northern Pacific railroad by the two divisions of the St. Paul and Pacific, which are now in process of construction, one extending from St. Anthony to Brainerd, and the other from St. Cloud to St. Vincent, on the N. W. border of the state, a distance of 315 m., crossing the Northern Pacific at Glyndon, 13 m. E. of the Red river. This road is now in operation from St. Cloud to Melrose, 35 m. From St. Vincent it is to be continued to Fort Garry in the province of Manitoba, 61 m. from the Minnesota border. Of those enrolled in the Minnesota district, 54 were steamers and 39 unrigged vessels; and of those in the Duluth district, 0 of 1,282 tons were steamers. Besides the above, 259 vessels of 153,792 tons entered at Duluth in the coastwise trade, and 204 of 154,292 tons cleared. In 1873 5 steam vessels of 510 tons and 4 barges were built in the Minnesota district. 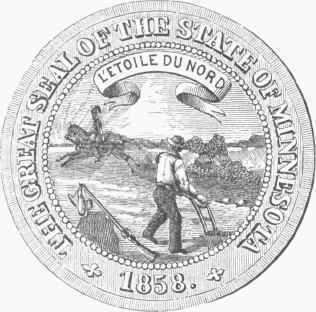 - Since 1857, when congress made to Minnesota a grant of six sections per mile of the public lands to aid in the construction of railroads, which was increased to ten sections per mile in 1865, not less than 13,200,000 acres of land, or more than one fourth of the entire area of the state, has been granted to railroad corporations, either by the general government or the state. These grants comprise 11,250,000 acres by congress and 1,950,-000 by the state; and 5,515,007 acres have already been conveyed to the companies. The railroad companies in the state organized under special charters are required to pay to the state, in lieu of all other taxes, 1 per cent, of their gross earnings for the first three years, 2 per cent, during the next seven years, and 3 per cent, thereafter. Other railroad companies can acquire the same privileges by complying with the provisions of the law. Capital stock Issued as reported by state commissioners, Sept. 1, 1873. Acres of land granted by congress. There were 32 national banks in operation in Minnesota, Nov. 1,1874, with a paid-in capital of $4,448,700; total amount of circulation issued, $4,455,000; amount outstanding at that date, $3,393,501, the latter being $7 71 per capita. The ratio of circulation to the wealth of the state was 1.5 per cent. ; to bank capital, 76.3 per cent. There were five savings banks, with deposits aggregating $843,498. The total number of fire and marine insurance companies transacting business in the state in 1873 was 45, including 2 Minnesota and 30 other American and 7 foreign companies. The number of life insurance companies was 35, of which only one was organized under the laws of the state. - The present constitution of Minnesota was adopted Oct, 13, 1857, and the government organized May 22, 1858. The qualifications for voters are, that they be males, 21 years of age, who are or have declared their intention of becoming citizens of the United States, and who have resided in the United States one year, and in the state four months next preceding. Indians and persons of mixed white and Indian blood, who have adopted the language, customs, and habits of civilization, are also allowed to vote in any district in which they have resided for the ten days next preceding. The legislature consists of 41 senators elected for two years, and 100 representatives elected for one year. They must be qualified voters and residents in the state one year, and in their respective districts six months next before the election. The election is held on the Tuesday after the first Monday in November of each year, and the legislature meets on the Tuesday after the first Monday in January. Its sessions are limited to 60 days. The executive department consists of a governor (salary $3,000), lieutenant governor, secretary of state ($1,800), treasurer ($3,500), attorney general ($1,000), all elected for two years, and an auditor ($2,500), elected for three years. The judiciary comprises a supreme court consisting of a chief and two associate justices (salary $3,000), nine district courts, and a probate court in each county, besides justices of the peace, who have jurisdiction where the amount in dispute does not exceed $100, and where the title to real estate is not involved. All judges are elected by the people, those of the supreme and district courts for seven years and the others for two years. The supreme court has power to issue all remedial writs, and appellate jurisdiction of judgments and orders of the district courts. 'The latter have original jurisdiction of all civil actions within their respective districts when the sum in contro-versv exceeds $100, all civil actions not within the jurisdiction of justices of the peace, and in equity; also appellate jurisdiction from courts of probate and justices of the peace. Besides the above named state officers, there is a commissioner of railroads and a commissioner of insurance. In 1872 a state board of health was established, consisting of seven physicians appointed by the governor from different sections of the state, who are required to make sanitary investigations, and collect and disseminate information concerning the causes of disease and the effects of localities, occupations, etc, on the general health. The public institutions are also made subject to their sanitary inspection, and they are required to report annually to the legislature. The state commissioner of statistics makes an annual report to the legislature, embodying the vital statistics of the state of agriculture, property, taxation, etc. The constitution provides for the taking of a state census in 18G5 and every ten years thereafter. The property, real or personal, owned by a married woman at the time of her marriage, continues to be her separate property. During marriage she may use and enjoy property and the earnings of her industry free from the husband's control and from liability for his debts. She may contract, and sue and be sued, as if she were single, the husband not being liable for her debts or contracts either before or during coverture, except for necessaries furnished to the wife after marriage, in sales of real estate by a married woman, however, the husband must join in the conveyance, unless he has deserted her for one year or she has cause of divorce against him. The causes of divorce are adultery, impotence, cruel and inhuman treatment, sentence to imprisonment in the state prison, wilful desertion for three years, habitual drunk-enness for a year, and cruelty. A married woman may make a will without the consent of her husband. A homestead comprising not more than HO acres of land in the country with the buildings, or one lot with the building thereon in any town, city, or village, is exempt from execution. The legal rate of in-terest is 7 per cent, in the absence of agreement; but any rate not exceeding 12 per cent., if agreed upon, will be valid.